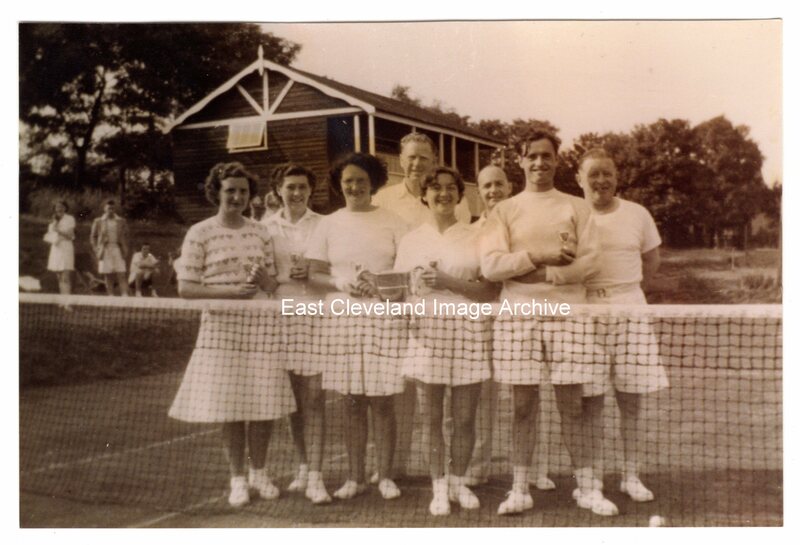 Proud winners of their trophy, Carlin How Tennis Team pictured on their tennis court, this image is from a collection compiled by Derick Pearson in the 1980s. Left to right: ?? , ?? , Freda Harrison (nee Marshall), Bill (Lemon) Harrison (crane driver at the steelworks), ?? , Edgar Scott, Charlie Webster (electrical shop), George Smith. Image courtesy of Carlin How Community Centre, thanks to to Derick Pearson for the update. Can anyone tell me if Freda Harrison and Bill (Lemon) Harrison were in any way related to Minnie Harrison who lived; I think in the row of houses opposite the Chippie at Carlin how? My Mam was Elsie Harrison (becoming Elsie PLEWS of Liverton Mines).